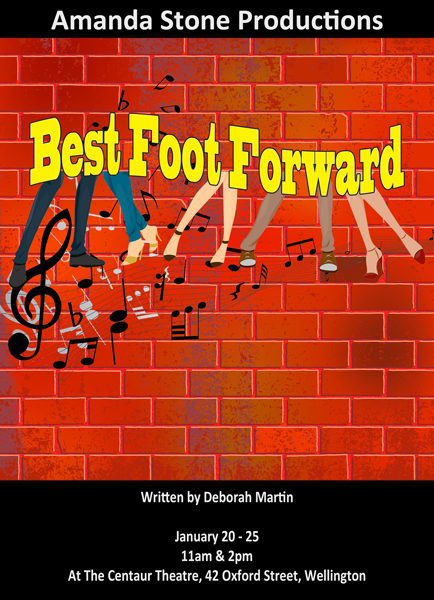 Best Foot Forward is a wonderful celebration of dance and community with a terrific and funny storyline that links together the song and dance items. There are 11 - 12 performance groups in the show along with six main characters. The show provides an opportunity to get young people fit and active while having loads of fun. The music is wonderful and is sure to get everyone moving! This concert is a toe tapping, colourful and entertaining show that celebrates dances and music from different periods so every item includes great choreography. For most performance items, there is a mini scene that depicts the era performed by a few members of the chorus. For example, the fifties dance is interrupted by a gang who want to take over the hall but turn out to be great rock and rollers! A jewel robbery is staged at the centenary ball and a TV crew comes to film the latest dance craze 'The Bump' in the sixties. These mini scenes help to portray each period and give chorus members speaking roles in the item. The scheming developer Daryl Dimond and his horrid assistant mean to demolish the great Starlight Dance Hall in order to build the tallest building in the city and become 'King of the Town'. Caretakers Tom and Donna plead with him to change his mind but he refuses. Throughout the show, Tom and Donna reminisce on all of the great times had in the dance hall over the past decades. Dances from some great eras are depicted including the roaring twenties, the big band forties, the rock and roll fifties, the sixties pop era, the disco seventies and the rap style of the nineties. Each item also depicts a small incident relevant to that era. Daryl appears to create trouble throughout the show and to add humour and pace while the next performance group prepares to enter. Local police Officer Rooney, now near retirement, also remembers some exciting times in the dance hall over the years. The Chicken Dance, The Macarena, The Bus Stop, The Nut Bush, The Heel Toe Polka, The Galopede, The Hokey Pokey, The Mexican Hat Dance, 'Balling the Jack' and many more are revisited. By the end, everyone is loving this toe tapping, colourful and entertaining concert that celebrates dance and music from different our recent past. The cast of the show is broken up into 11 - 12 performance groups that can vary in size and a small group of main characters. The main characters will always be in the wings as they come on and off regularly, linking together all of the various performances. The two lead characters are the soft spoken Tom and the fiery Donna who are trying to save the dance hall. The role of Officer Rooney is a supporting but important one and requires an actor with good comedic chops. The role of Daryl Dimond needs a confident actor who can sing and dance. What makes the requirements for this role unique is that the character appears twice at different ages, first as a youth during the fifties and then later in the seventies. This means that different actors can play the part at different ages but the same actor could also play both parts. Nancy is Daryl's assistant and also requires a confident actor with a good sense of humour. Lastly there is Kathy Goodeye who is trying to stop Daryl and his plans to demolish the dance hall. Along with these parts there are also mini scenes that are acted out during the song and dance numbers. These give a group of about 4 - 6 performers the chance to have speaking roles in the show.